Size comparison of Gliese 581g with Earth and Neptune. Gliese 581g /ˈɡliːzə/, unofficially known as Zarmina (or Zarmina's World), is an unconfirmed (and frequently disputed) exoplanet claimed to orbit within the Gliese 581 system, twenty light-years from Earth. It was discovered by the Lick–Carnegie Exoplanet Survey, and is the sixth planet orbiting the star; however, its existence could not be confirmed by the European Southern Observatory (ESO) / High Accuracy Radial Velocity Planet Searcher (HARPS) survey team, and its existence remains controversial. It is thought to be near the middle of the habitable zone of its star. That means it could sustain liquid water—a necessity for all known life—on its surface, if there are favorable atmospheric conditions on the planet. Gliese 581g was claimed to be detected by astronomers of the Lick–Carnegie Exoplanet Survey. The authors stated that data sets from both High Resolution Echelle Spectrometer (HIRES) and HARPS were needed to sense the planet; however, the ESO/HARPS survey team could not confirm its existence. The planet remained unconfirmed as consensus for its existence could not be reached. Additional reanalysis only found evidence for four planets, but the discoverer, Steven S. Vogt, did not agree with those conclusions; another study by Guillem Anglada-Escudé later supported the planet's existence. In 2012, a reanalysis by Vogt supported its existence. A new study in 2014 concluded that it was a false positive; however, in 2015, a reanalysis of the data suggested that it could still exist. The planet is thought to be tidally locked to its star. If the planet has a dense atmosphere, it may be able to circulate heat. The actual habitability of the planet depends on the composition of its surface and the atmosphere. It is thought to have temperatures around −37 to −11 °C (−35 to 10 °F). By comparison, Earth has an average surface temperature of 15 °C (59 °F)—while Mars has an average surface temperatures of about −63 °C (−81 °F). The planet has, according to Vogt, a "100%" chance of supporting life, but this is disputed. The supposed detection of Gliese 581g foreshadows what Vogt calls "a second Age of Discovery". The six-planet model of the Gliese 581 system with circular orbits. The planet was claimed, in September 2010, to have been detected by astronomers in the Lick–Carnegie Exoplanet Survey, led by principal investigator Steven Vogt, professor of astronomy and astrophysics at the University of California, Santa Cruz, and co-investigator R. Paul Butler of the Carnegie Institution of Washington. The discovery was made using radial velocity measurements, combining 122 observations obtained over 11 years from the HIRES instrument of the W. M. Keck Observatory with 119 measurements obtained over 4.3 years from the HARPS instrument of the ESO 3.6 m Telescope at La Silla Observatory. In addition, brightness measurements of the star were confirmed with a robotic telescope from Tennessee State University. After subtracting the signals of the previously known Gliese 581 planets, b, c, d and e, the signals of two additional planets were apparent: a 445-day signal from a newly recognized outermost planet designated f, and the 37-day signal from Gliese 581g. The probability that the detection of the latter was spurious was estimated at only 2.7 in a million. The authors stated that while the 37-day signal is "clearly visible in the HIRES data set alone", "the HARPS data set alone is not able to reliably sense this planet" and concluded, "It is really necessary to combine both data sets to sense all these planets reliably". The Lick–Carnegie team explained the results of their research in a paper published in the Astrophysical Journal, which were also made available in preprint version on arXiv. Although not sanctioned by the IAU's naming conventions, Vogt's team informally refers to the planet as "Zarmina's World" after his wife, and in some cases simply as Zarmina. During a press release announcing the discovery, Vogt et al. acknowledged that the "Gliese 581 system has a somewhat checkered history of habitable planet claims," as two previously discovered planets in the same system, Gliese 581c and d, were also regarded as potentially habitable, but later evaluated as being outside the conservatively defined habitable zone. Two weeks after the announcement of the discovery of Gliese 581g, another team—led by Michael Mayor of the Geneva Observatory— reported that in a new analysis of 179 measurements taken by the HARPS spectrograph over 6.5 years, neither planet g nor planet f was detectable. An astronomer who works on HARPS data at the Geneva Observatory, Francesco Pepe, said in an email for an Astrobiology Magazine article republished on Space.com, "The reason for that is that, despite the extreme accuracy of the instrument and the many data points, the signal amplitude of this potential fifth planet is very low and basically at the level of the measurement noise". The Geneva team had also published their paper on arXiv, but it appeared to not have been accepted for publication. Vogt responded to the latest concerns by saying, "I am not overly surprised by this as these are very weak signals, and adding 60 points onto 119 does not necessarily translate to big gains in sensitivity." More recently, Vogt added, "I feel confident that we have accurately and honestly reported our uncertainties and done a thorough and responsible job extracting what information this data set has to offer. I feel confident that anyone independently analyzing this data set will come to the same conclusions." Differences in the two groups' results may involve the planetary orbital characteristics assumed in calculations. According to Massachusetts Institute of Technology astronomer Sara Seager, Vogt postulated the planets around Gliese 581 had perfectly circular orbits whereas the Swiss group thought the orbits were more eccentric. This difference in approach may be the reason for the disagreement, according to Alan Boss. Butler remarked that with additional observations, "I would expect that on the time scale of a year or two this should be settled." Other astronomers also supported a deliberate evaluation: Seager stated, "We will have consensus at some point; I don't think we need to vote right now." and Ray Jayawardhana noted, "Given the extremely interesting implications of such a discovery, it's important to have independent confirmation." Gliese 581g is listed as "unconfirmed" in the Extrasolar Planets Encyclopaedia. In December 2010, a claimed methodological error was reported—by a group led by Rene Andrae of the Max Planck Institute for Astronomy—in the data analysis that led to the discovery of Gliese 581f and g.
In 2011, another reanalysis—performed by a group led by Philip Gregory of the University of British Columbia—found no clear evidence for a fifth planetary signal in the combined HIRES/HARPS data set. The claim was made that the HARPS data provided only some evidence for 5 planet signals, while incorporation of both data sets actually degraded the evidence for more than four planets (i.e., none for 581f or 581g). Mikko Tuomi of the University of Hertfordshire performed a Bayesian reanalysis of the HARPS and HIRES data with the result that they "do not imply the conclusion that there are two additional companions orbiting GJ 581". "I have studied [the paper] in detail and do not agree with his conclusions," Steven Vogt said in reply, concerned that Gregory has considered the HIRES data as more uncertain. "The question of Gliese 581g's existence won't be settled definitively until researchers gather more high-precision radial velocity data", Vogt said. However Vogt expects further analysis to strengthen the case for the planet. By performing a number of statistical tests, Guillem Anglada-Escudé of the Carnegie Institute of Washington concluded that the existence of Gl 581g was well supported by the available data, despite the presence of a statistical degeneracy that derives from an alias of the first eccentric harmonic of another planet in the system. In a forthcoming paper, Anglada-Escudé and Rebekah Dawson claimed that, "with the data we have, the most likely explanation is that this planet is still there." In July 2012, Vogt reanalyzed the 2011 data proposed by Forveille et al., noting that there were five objects (Gliese 581b, e, c, g, d, with no evidence for f). Planet g was orbiting around 0.13 AU with an orbital period of thirty-two days, placing it inside the habitable zone. Vogt concluded that the object had a minimum mass of 2.2 M and had a false positive probability of less than 4%. Vogt also said that they couldn't come to same conclusion as the Geneva team, without removing data points, "I don't know whether this omission was intentional or a mistake," he said, "I can only say that, if it was a mistake, they've been making that same mistake more than once now, not only in this paper, but in other papers as well." Vogt then said that the planet was there as long as all of the planets had circular orbits, and that the circular orbits work because “of dynamic stability, goodness-of-fit, and principle of parsimony (Occam's Razor)." A study in 2014—published in Science— led by postdoctoral researcher Paul Robertson concluded that Gliese 581d is "an artifact of stellar activity which, when incompletely corrected, causes the false detection of planet g." "They were very high value targets if they were real," Robertson said, "But unfortunately we found out that they weren't." It was pointed out—during a press release by Penn State University—that sunspots could sometimes masquerade as planetary signals. An additional study concluded that Gliese 581g's existence depends on Gliese 581d's eccentricity. The planet was later delisted from the Habitable Exoplanets Catalog, which is run by the University of Puerto Rico at Arecibo. Later, in October that year, Abel Mendez wrote—in a blog post characterizing "false starts" in exoplanet habitability— that the planet does not exist. 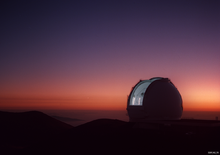 In 2015, a team of researchers led by Guillem Anglada-Escudé of the University of London reanalyzed the data and suggested planet Gliese 581d really could exist, despite stellar variability, and that last year's claim of the existence of Gliese 581d and g was triggered by poor and inadequate analysis of the data, saying that the statistical method used by Robertson's team was "simply inadequate for identifying small planets like Gliese 581d", urging that the data be reanalyzed using a "more accurate model." Because of Gliese 581g's proximity to its parent star, it is predicted to be tidally locked to Gliese 581. Just as Earth's Moon always presents the same face to the Earth, the length of Gliese 581g's sidereal day would then precisely match the length of its year, meaning it would be permanently light on one half and permanently dark on the other half of its surface. An atmosphere that is dense will circulate heat, potentially allowing a wide area on the surface to be habitable. For example, Venus has a solar rotation rate approximately 117 times slower than Earth's, producing prolonged days and nights. Despite the uneven distribution of sunlight over time intervals shorter than several months, unilluminated areas of Venus are kept almost as hot as the day side by globally circulating winds. Simulations have shown that an atmosphere containing appropriate levels of CO2 and H2O need only be a tenth the pressure of Earth's atmosphere (100 mbar) to effectively distribute heat to the night side. Current technology cannot determine the atmospheric or surface composition of the planet due to the overpowering light of its parent star. Whether or not a tidally locked planet with the orbital characteristics of Gliese 581g is actually habitable depends on the composition of the atmosphere and the nature of the planetary surface. A comprehensive modeling study including atmospheric dynamics, realistic radiative transfer and the physics of formation of sea ice (if the planet has an ocean) indicates that the planet can become as hot as Venus if it is dry and allows carbon dioxide to accumulate in its atmosphere. The same study identified two habitable states for a water-rich planet. If the planet has a very thin atmosphere, a thick ice crust forms over most of the surface, but the substellar point remains hot enough to yield a region of thin ice or even episodically open water. If the planet has an atmosphere with Earthlike pressures, containing approximately 20% (molar) carbon dioxide, then the greenhouse effect is sufficiently strong to maintain a pool of open water under the substellar point with temperatures comparable to the Earth's tropics. This state has been dubbed "Eyeball Earth" by the author. Modeling of the effect of tidal locking on Gliese 581g's possible atmosphere, using a general circulation model employing an atmosphere with Earthlike surface pressure but a highly idealized representation of radiative processes, indicates that for a solid-surface planet the locations of maximum warmth would be distributed in a sideways chevron-shaped pattern centered near the substellar point. It is estimated that the average global equilibrium temperature (the temperature in the absence of atmospheric effects) of Gliese 581g would range from 209 to 228 K (−64 to −45 °C, or −84 to −49 °F) for Bond albedos (reflectivities) from 0.5 to 0.3 (with the latter being more characteristic of the inner Solar System). Adding an Earthlike greenhouse effect would yield an average surface temperature in the range of 236 to 261 K (−37 to −12 °C, or −35 to 10 °F). Gliese 581g would be in an orbit where a silicate weathering thermostat could operate, and this could lead to accumulation of sufficient carbon dioxide in the atmosphere to permit liquid water to exist at the surface, provided the planet's composition and tectonic behavior could support sustained outgassing. By comparison, Earth's present global equilibrium temperature is 255 K (−18 °C), which is raised to 288 K (15 °C) by greenhouse effects. However, when life evolved early in Earth's history, the Sun's energy output is thought to have been only about 75% of its current value, which would have correspondingly lowered Earth's equilibrium temperature under the same albedo conditions. Yet Earth maintained equable temperatures in that era, perhaps with a more intense greenhouse effect, or a lower albedo, than at present. Current Martian surface temperatures vary from lows of about −87 °C (−125 °F) during polar winter to highs of up to −5 °C (23 °F) in summer. The wide range is due to the rarefied atmosphere, which cannot store much solar heat, and the low thermal inertia of the soil. Early in its history, a denser atmosphere may have permitted the formation of an ocean on Mars. The planet is thought to be located within the habitable zone of its parent star, a red dwarf, which is cooler than the Sun. That means planets need to orbit closer to the star than in the Solar System to maintain liquid water on their surface. While habitability is generally defined by the planets ability to support liquid water, there are many factors that can influence it. This includes the atmosphere of the planet and the variability of its parent star in terms of emitting energy. In an interview with Lisa-Joy Zgorski of the National Science Foundation, Steven Vogt was asked what he thought about the chances of life existing on Gliese 581g. Vogt was optimistic: "I'm not a biologist, nor do I want to play one on TV. Personally, given the ubiquity and propensity of life to flourish wherever it can, I would say that... the chances of life on this planet are 100%. I have almost no doubt about it." In the same article Dr. Seager is quoted as saying "Everyone is so primed to say here's the next place we're going to find life, but this isn't a good planet for follow-up." According to Vogt, the long lifetime of red dwarfs improves the chances of life being present. "It's pretty hard to stop life once you give it the right conditions", he said. According to the Associated Press interview with Steven Vogt, "Life on other planets doesn't mean E.T. Even a simple single-cell bacteria or the equivalent of shower mold would shake perceptions about the uniqueness of life on Earth." 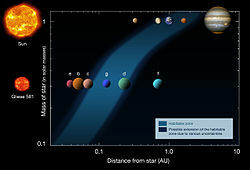 If the fraction of stars with potentially habitable planets (η⊕, "eta-Earth") is on the order of a few tens of percent as Vogt proposes, and the Sun's stellar neighborhood is a typical sample of the galaxy, then the discovery of Gliese 581g in the habitable zone of its star points to the potential of billions of Earthlike planets in our Milky Way galaxy alone. ^ a b c d e f g h i j k l m n o p q r Vogt, Steven S.; Butler, R. Paul; Rivera, Eugenio J.; Haghighipour, Nader; Henry, Gregory W.; Williamson, Michael H. (September 29, 2010). "The Lick-Carnegie Exoplanet Survey: A 3.1 M_Earth Planet in the Habitable Zone of the Nearby M3V Star Gliese 581". The Astrophysical Journal. 723 (1): 954–965. arXiv:1009.5733. Bibcode:2010ApJ...723..954V. doi:10.1088/0004-637X/723/1/954. ^ Smith, Yvette (September 29, 2010). "NASA and NSF-Funded Research Finds First Potentially Habitable Exoplanet". NASA. Retrieved May 27, 2016. ^ a b Overbye, Dennis (August 20, 2012). "Just Right, or Nonexistent? Dispute Over 'Goldilocks' Planet Gliese 581G". The New York Times. ISSN 0362-4331. Retrieved January 7, 2017. ^ a b Alleyne, Richard (September 29, 2010). "Gliese 581g the most Earth like planet yet discovered". The Daily Telegraph. London. Archived from the original on October 2, 2010. Retrieved September 30, 2010. ^ Sanders, Laura. "A little wobble spurs hope for finding life on distant worlds: extrasolar planet is in the right location to be habitable". Retrieved January 21, 2017. ^ a b c Vogt, Steven S.; Butler, R. Paul; Haghighipour, Nader (July 18, 2012). "GJ 581 update: Additional Evidence for a Super-Earth in the Habitable Zone". Astronomische Nachrichten. 333 (7): 561–575. arXiv:1207.4515. Bibcode:2012AN....333..561V. doi:10.1002/asna.201211707. ^ a b Quenqua, Douglas (July 7, 2014). "Earthlike Planets May Be Merely an Illusion". New York Times. Retrieved July 8, 2014. ^ a b c Stephens, Tim (September 29, 2010). "Newly discovered planet may be first truly habitable exoplanet". University News & Events. University of California, Santa Cruz. ^ Wall, Mike. "Gliese 581g Tops List of 5 Potentially Habitable Alien Planets". Space.com. Purch Group. Retrieved February 17, 2017. ^ Hsu, Jeremy. "A Million Questions About Habitable Planet Gliese 581g (Okay, 12)". Space.com. Purch Group. Retrieved February 17, 2017. ^ a b c d e f g h i j k l m n o p q r s t u v w x y z aa ab ac ad Howell, Elizabeth (May 4, 2016). "Gliese 581g: Potentially Habitable Planet — If It Exists". Space.com. Purch Group. Retrieved January 23, 2017. ^ Wall, Mike. "Is Planet Gliese 581g Really the 'First Potentially Habitable' Alien World?". Space.com. Purch Group. Retrieved February 17, 2017. ^ Grant, Andrew. "Habitable planets' reality questioned: star's magnetic activity could have led to false detections". Retrieved January 21, 2017. ^ a b c NSF. Press Release 10-172 - Video. Event occurs at 41:25-42:31. See Overbye, Dennis (September 29, 2010). "New Planet May Be Able to Nurture Organisms". The New York Times. Retrieved September 30, 2010. ^ Alexander, Amir. "Billions and Billions? Discovery of Habitable Planet Suggests Many More are Out There". The Planetary Society. Archived from the original on 2010-10-09. Retrieved October 8, 2010. ^ Vogt, Steven (2010). "The Lick-Carnegie Exoplanet Survey: A 3.1 M☉ Planet in the Habitable Zone of the Nearby M3V Star Gliese 581". The Astrophysical Journal. 723: 954–965. arXiv:1009.5733. Bibcode:2010ApJ...723..954V. doi:10.1088/0004-637X/723/1/954. ^ Meichsner, Von Irene (September 30, 2010). "Erdähnlicher Planet entdeckt" [Terrestrial Planet discovered]. Kölner Stadt-Anzeiger (in German). Archived from the original on October 2, 2010. Retrieved October 5, 2010. ^ a b Kerr, Richard A. (October 12, 2010). "Recently Discovered Habitable World May Not Exist". Science Now. AAAS. Retrieved October 12, 2010. ^ Bonfils; Delfosse; Udry; Forveille; Mayor; Perrier; Bouchy; Gillon; Lovis (2011). "The HARPS search for southern extra-solar planets XXXI. The M-dwarf sample". Astronomy. 549: A109. arXiv:1111.5019. Bibcode:2013A&A...549A.109B. doi:10.1051/0004-6361/201014704. ^ Mullen, Leslie (October 12, 2010). "Doubt Cast on Existence of Habitable Alien World". Astrobiology Magazine. Retrieved October 12, 2010. ^ Grossman, Lisa (October 12, 2010). "Exoplanet Wars: "First Habitable World" May Not Exist". Wired. Retrieved October 12, 2010. ^ Wall, Mike (October 13, 2010). "Astronomer Stands By Discovery of Alien Planet Gliese 581g Amid Doubts". Space.com. Retrieved October 13, 2010. ^ a b c Cowen, Ron (October 13, 2010). "Swiss team fails to confirm recent discovery of an extrasolar planet that might have right conditions for life". Science News. Retrieved October 13, 2010. ^ Rene Andrae; Tim Schulze-Hartung; Peter Melchior (2010). "Dos and don'ts of reduced chi-squared". arXiv:1012.3754 [astro-ph.IM]. ^ a b Gregory (2011). "Bayesian Re-analysis of the Gliese 581 Exoplanet System". Monthly Notices of the Royal Astronomical Society. 415 (3): 2523–2545. arXiv:1101.0800. Bibcode:2011MNRAS.415.2523G. doi:10.1111/j.1365-2966.2011.18877.x. ^ Mikko Tuomi (2011). "Bayesian re-analysis of the radial velocities of Gliese 581. Evidence in favour of only four planetary companions". Astronomy & Astrophysics. 528: L5. arXiv:1102.3314. Bibcode:2011A&A...528L...5T. doi:10.1051/0004-6361/201015995. ^ "Habitable planet find doubted by B.C. scientist". Canadian Broadcasting Corporation. January 14, 2011. ^ Wall, Mike (February 19, 2011). "R.I.P. Possibly Habitable Planet Gliese 581g? Not So Fast, Co-Discoverer Says". Space.com. Purch Group. ^ Yudhijt Bhattacharjee (July 27, 2012). "Data Dispute Revives Exoplanet Claim". Science. 337 (6093): 398. Bibcode:2012Sci...337..398B. doi:10.1126/science.337.6093.398. PMID 22837499. ^ Guillem Anglada-Escudé (2010). "Aliases of the first eccentric harmonic : Is GJ 581g a genuine planet candidate?". arXiv:1011.0186 [astro-ph.EP]. ^ Grossman, Lisa (January 18, 2011). "New Study Finds No Sign of 'First Habitable Exoplanet'". Wired. ^ a b c d Chung, Emily (July 4, 2014). "Earth-like planets Gliese 581g and d likely don't exist, study says". Canadian Broadcasting Corporation. Retrieved January 5, 2017. ^ a b Robertson, Paul; Mahadevan, Suvrath; Endl, Michael; Roy, Arpita (July 25, 2014). "Stellar activity masquerading as planets in the habitable zone of the M dwarf Gliese 581". Science. 345 (6195): 440–444. arXiv:1407.1049. Bibcode:2014Sci...345..440R. CiteSeerX 10.1.1.767.2071. doi:10.1126/science.1253253. PMID 24993348. Retrieved July 8, 2014. ^ Mendez, Abel. "False Starts: Potentially Habitable Exoplanets". Planetary Habitability Laboratory. University of Puerto Rico. Retrieved 28 February 2017. ^ "Reanalysis of data suggests 'habitable' planet GJ 581d really could exist". Astronomy Now. March 9, 2015. Retrieved May 27, 2015. ^ a b Berardelli, Phil (September 29, 2010). "Astronomers Find Most Earth-like Planet to Date". ScienceNOW. Archived from the original on October 2, 2010. Retrieved September 30, 2010. ^ Alpert, Mark (November 7, 2005). "Red Star Rising". Scientific American. Retrieved April 25, 2007. ^ Joshi, M. M.; Haberle, R. M.; Reynolds, R. T. (October 1997). "Simulations of the Atmospheres of Synchronously Rotating Terrestrial Planets Orbiting M Dwarfs: Conditions for Atmospheric Collapse and the Implications for Habitability". Icarus. 129 (2): 450–465. Bibcode:1997Icar..129..450J. doi:10.1006/icar.1997.5793. ^ Shiga, David (September 29, 2010). "Found: first rocky exoplanet that could host life". New Scientist. Retrieved September 30, 2010. ^ a b c Pierrehumbert, R. T. (December 27, 2010). "A Palette of climates for Gliese 581g" (PDF). Astrophysical Journal Letters. 726 (1): L8. Bibcode:2011ApJ...726L...8P. doi:10.1088/2041-8205/726/1/L8. Retrieved December 27, 2010. ^ Heng, Kevin; Vogt, Steven S. (October 25, 2010). "Gliese 581g as a scaled-up version of Earth: atmospheric circulation simulations". Monthly Notices of the Royal Astronomical Society. 415 (3): 2145–2157. arXiv:1010.4719. Bibcode:2011MNRAS.415.2145H. doi:10.1111/j.1365-2966.2011.18853.x. ^ Grossman, Lisa (November 1, 2010). "Climate Model Suggests Where the Aliens Are". Wired News. Condé Nast Publications. Retrieved November 3, 2010. ^ a b "NASA, Mars: Facts & Figures". Retrieved January 28, 2010. ^ Mallama, A.; Wang, D.; Howard, R. A. (2006). "Venus phase function and forward scattering from H2SO4". Icarus. 182 (1): 10–22. Bibcode:2006Icar..182...10M. doi:10.1016/j.icarus.2005.12.014. ^ Mallama, A. (2007). "The magnitude and albedo of Mars". Icarus. 192 (2): 404–416. Bibcode:2007Icar..192..404M. doi:10.1016/j.icarus.2007.07.011. ^ Sagan, C.; Mullen, G. (1972). "Earth and Mars: Evolution of Atmospheres and Surface Temperatures". Science. 177 (4043): 52–56. Bibcode:1972Sci...177...52S. doi:10.1126/science.177.4043.52. PMID 17756316. ^ "Mars' desert surface..." MGCM Press release. NASA. Archived from the original on July 7, 2007. Retrieved February 25, 2007. ^ Boyce, J. M.; Mouginis, P.; Garbeil, H. (2005). "Ancient oceans in the northern lowlands of Mars: Evidence from impact crater depth/diameter relationships". Journal of Geophysical Research. 110 (E03008): n/a. Bibcode:2005JGRE..11003008B. doi:10.1029/2004JE002328. ^ a b Borenstein, Seth (September 30, 2010). "Could 'Goldilocks' planet be just right for life?". The Washington Post. Nash Holdings LLC. Associated Press. Retrieved January 6, 2017. ^ "Potentially habitable planet discovered". Carnegie Institution for Science. Retrieved January 21, 2017. Wikimedia Commons has media related to Star system Gliese 581. National Science Foundation (2010-09-29). "Steven Vogt and Paul Butler lead a team that discovered the first potentially habitable exoplanet". Video: Steven Vogt of UC Santa Cruz and UC Observatories and Paul Butler of the Carnegie Institution of Washington join NSF's Lisa-Joy Zgorski to announce the discovery of the first exoplanet that has the potential to support life. "NASA and NSF-Funded Research Finds First Potentially Habitable Exoplanet". Release 10-237. NASA. 2010-09-29. This page was last edited on 22 April 2019, at 11:31 (UTC).